Killer in the Mist. Long exposure Alligator. Killer in the Mist, Florida Everglades. Settings: 1/5 second, f25, ISO 100 (LO 1) and Gitzo GM 3551 Monopod. 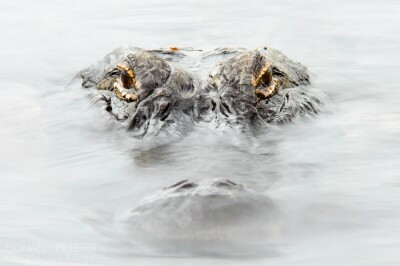 This alligator was l.a.r.g.e., but more importantly, if I lay down near the bank, it was in a prime position looking straight down the barrel of the lens at me, showing off that intense stare…and I really wanted to get a shot which captured that. It was also sitting in some pretty ugly looking water (read as dull, reflecting grey skies and very choppy from the wind) near some fishermen at Loxahatchee Reserve in Florida, which is part of the Everglades. Sitting just on the surface, it was waiting around for the fish that the fishermen were trying to catch. They assured me it was quite safe to lay down near the waters edge (I should point out, there was about a 3 or 4 foot drop to the water) and that if I got too close the gator would actually retreat under water. So, I lay down and edged my way in to position so as not to spook the gator in to retreating – much to the bemusement of passersby! I was wishing for some nice blue sky to reflect and give some colour, but instead was faced with the washed out, grey/white, choppy water mentioned above. I took a few shots but the water just looked awful and distracting, so I decided to experiment a little to try make the most of the situation. I really like the effect on water with slow shutter speeds, that is more often associated with landscape photography, and decided that might work well in this situation. So, I set about trying to get the slowest shutter speed I could with my 200-400 and D3 in the middle of the day! This involved bracing the camera as still as possible by laying my monopod out flat and wedging it against a boulder whilst supporting the lens just off the ground with my arm. It also meant stopping down to f25 and putting the ISO on my D3 to LO 1 (or fake ISO 100) which I would normally never dream of doing. On this occasion however, it was required to block out as much daylight from the sensor as possible. I took a lot of shots as the gator was swaying slightly in the water so had many attempts to get him sharp, but eventually I got one frame where he stayed almost perfectly still for the duration of the exposure…the Red Tailed Pennant on its head was just a nice added bonus. This all resulted in a photo that smooths things out nicely and gives a slightly more surreal feel with that misty look where the alligator meets the water – rather than the defined hard lines and ‘frozen in time water’ I was getting under normal shooting conditions.